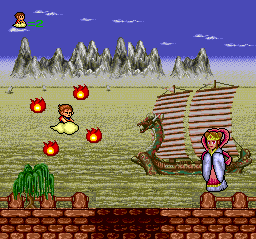 I've never liked the looks of this PC Engine shoot 'em up, which is based on the legend of the Monkey King. That's because I've always considered it to be the two-dimensional shmup equivalent of too many of today's three-dimensional FPS titles: Brown, dark and drab. It's almost like Gokuraku! Chuka Taisen's developers decided, "There are too many cheerful and colorful PC Engine shooters. Let's make one that's the complete opposite!" So, I ignored this HuCard like a pixelated plague. Until I came to the realization that Taito released a ton of surprisingly great games for NEC's adorable little system--such as Don Doko Don, Hana Taka Daka! ?, Jigoku Meguri, Mizubaku Daibouken, The New Zealand Story and Parasol Stars--back in the day. Giving Gokuraku! Chuka Taisen a second chance with that in mind helped a great deal. For starters, once I looked past this game's gloomy graphics (don't be fooled by the screenshot below) and focused instead on its gameplay, I found that it's a pretty great shoot 'em up. More specifically, I discovered that it's both tight (in terms of controls) and tough--two things a shmup needs to offer for me to fall in love with it. I also discovered that it has some awesome boss fights, which I believe rival those found in Coryoon and PC Denjin (aka Air Zonk) when it comes to beauty and brilliance (thanks in large part to the many layers of parallax scrolling they contain). Gokuraku! Chuka Taisen's soundtrack is nice, too. Sadly, it's often drowned out by the game's overly loud "pew pew" effects that accompany each and every shot. That lone misstep--well, if you don't count the dreary aesthetics--isn't nearly enough to get me to continue to ignore this 1992 release, of course. On the contrary, I now regularly find myself playing and enjoying it regularly due to the aspects mentioned above. Do I still consider it to be a rather unattractive title? Yes, I do. But it no longer means more to me than the rest of what it has to offer any gamer interested in playing a retro shoot 'em up that isn't a total pushover. Seems like quite a decent game to me :) I am generally a big fan of Taito's stuff so I'll happily overlook the gloomy visuals and give this one a try, thanks! I see drab backgrounds, but I also see brilliantly colored weapons and enemies. At least in these screens. Maybe the rest of them are boring and ugly? Simon: Yes, give it a try. It's a difficult game, but still a lot of fun. And the boss fights are really impressive. BTW, I'm ashamed to admit that I'm late to coming around on Taito's non-arcade output. I mean, I've always known Taito early arcade games were great, but I've never given too much thought to their console games. Now, though, I realize that many of their Famicom/NES and PC Engine are amazing. Gah! Justin: Well, don't be too fooled by that second screen -- it's from the first boss fight, and like I said in the post, the boss fights are pretty brilliant. Check out a video or two of the first few levels of the game sometime and you'll see that the overall look of the game is rather drab/dull, at least in terms of its color scheme. It's a great game regardless, though, so check it out sometime via emulation if you're at all curious! Always good to hear you found yourself enjoying something you didn't think you would in any case, thank you for the post! Well, I had to include at least one screenshot of a boss fight, Kimimi, as they're without a doubt the visual highlight of the game. Don't be fooled, though, the rest of the game is much less vibrant in terms of colors and visuals. Still, it's actually a good-looking game -- albeit a bit dreary -- when you take a good look at it. You should check it out at some point, as I think you'd really like it (if you like old-school shoot 'em ups, that is).